When I was younger I invested a lot of time into studying geometric algebra. Geometric algebra is a system where you can add, subtract and multiply oriented linear subspaces like lines and hyperplanes (cf. Grassmanian). These things are pretty important if you’re doing geometry, so it’s worth it to learn many ways to work with them. Geometric algebra emphasizes exterior products as a way to parameterize these primitives (cf. Plücker coordinates). Proponents claim that it’s simpler and more efficient than using “linear algebra”, but is this really the case? As the span of a collection of k vectors. As the solution to a set of n – k linear equations. In the second, the solution of a set of n-k linear equations is another way of saying the kernel of an (n – k)-by-n matrix, . These two forms are dual to one another in the sense that taking the matrix transpose of one representation gives a different subspace, which happens to be it’s orthogonal complement. The best parameterization depends on the application and the size of the flat under consideration. Stuff that’s easy to do in one form may be harder in the other and vice-versa. To get more specific, let’s consider the problem of intersecting and joining two subspaces. If we have a pair of flats represented by systems of equations, then computing their intersection is trivial: just concatenate all the equations together. Similarly we can compute the smallest enclosing subspace of a set of subspaces which are all given by spans: again just concatenate them. And we can test if a subspace given by a span is contained in one given by equations by plugging in each of the basis vectors and checking that the result is contained in the kernel (ie maps to 0). And if a flat is a system of equations, ie , then we need to multiply by the inverse transpose of . The well known rule that normal vectors must transform by inverse transposes is a special case of the above. Finally we can convert between these two forms, but it takes a bit of work. For example, finding the line determined by the intersection of two planes through the origin in 3D is equivalent to solving a 2×2 linear system. In the general case one can use Gaussian elimination. I don’t really know. At this point I’m too far gone to learn something else, but it’s much easier for me to keep these two ideas in my head and just grind through some the same basic matrix algorithm over and over than to work with all the specialized geometric algebra terms. Converting things into exterior forms and plucker coordinates always seems to slow me down with extra details (is this a vee product, inner product, circle, etc. ), but maybe it works for some people. Last time, we discussed collision detection in general and surveyed some techniques for narrow phase collision detection. 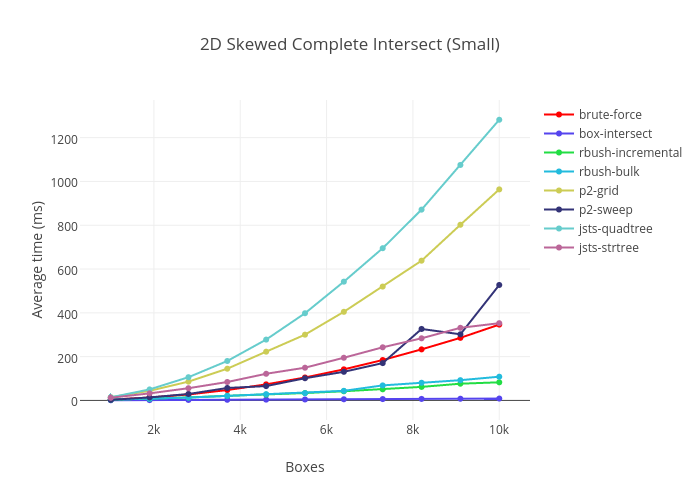 In this article we will go into more detail on broad phase collision detection for closed axis-aligned boxes. This was a big problem in the 1970’s and early 1980’s in VLSI design, which resulted in many efficient algorithms and data structures being developed around that period. Here we survey some approaches to this problem and review a few theoretical results. For example, in 2D the first form is equivalent to representing a box as a corner point together with its width and height (e.g. left, top, width, height), while the second is equivalent to storing a pair of bounds (e.g. ). 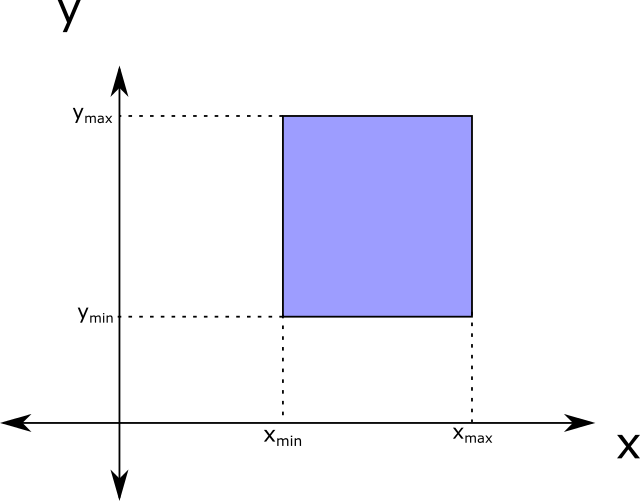 A 2D box is the cartesian product of two 1D intervals. In my experiments, I found that the first test was about 30-40% faster in Chrome 39 on my MacBook, (though this is probably compiler and architecture dependent so take it with a grain of salt). The second test is more robust as it does not require any arithmetic operations. This means that it cannot fail due to overflow or rounding errors, making it more suitable for floating point inputs or applications where exact results are necessary. It also works with unbounded (infinite) intervals, which is useful in many problems. For applications like games where speed is of the utmost importance, one could make a case for using the first form. However, in applications where it is more important to get correct results (and not crash!) robustness is a higher priority. As a result, we will generally prefer to use the second form. If the number of intervals is , then there are events total, and so sorting them all takes time. Processing event requires a scan through the active set, however for each iteration one intersecting pair is reported. If the total number of collisions is , then the amortized cost of looping over the events is . Therefore, the total running time of this algorithm is in . 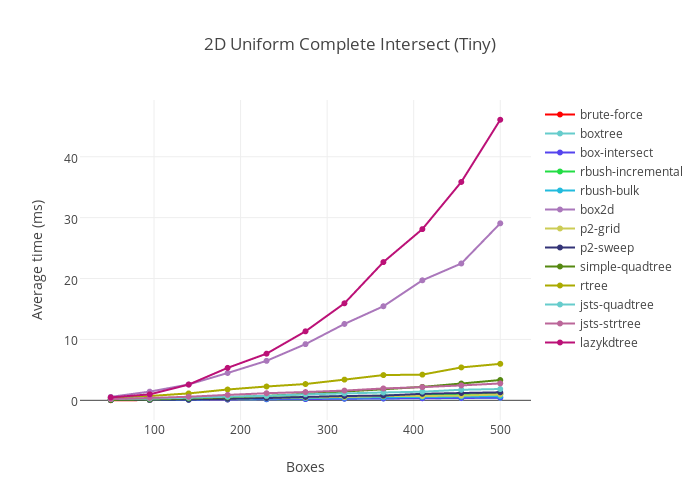 The sweep and prune method for box intersection detection. For objects which are well separated along some axis, the simple sweep-and-prune technique is very effective at speeding up collision detection. However, if the objects are grouped together, then sweep-and-prune is less effective, realizing a complexity no better than brute force . In a grid, boxes are inserted into cells which they overlap incrementally, and tested against other boxes in the same grid cells. 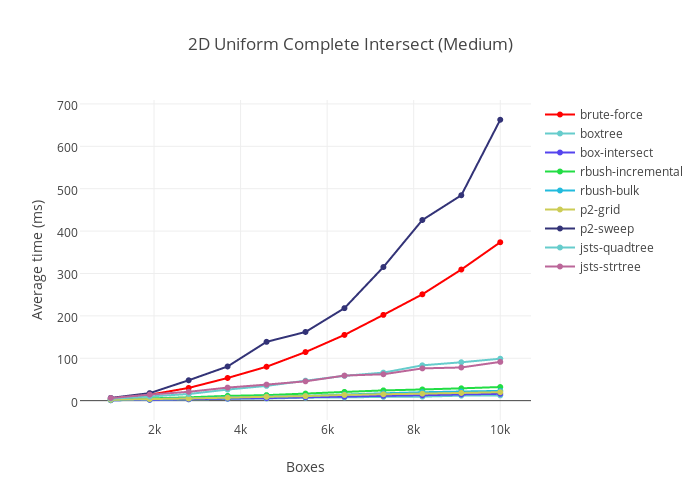 Note here how duplicate pairs are handled: Because in a grid it is possible that we may end up testing the same pair of boxes against each other many times, we need to be careful that we don’t accidentally report multiple pairs of collisions. One way to prevent this is to check if the current grid cell is the lexicographically smallest cell in their intersection. If it isn’t, then we skip reporting the pair. Dense array: Here the grid is encoded as a flat array of memory. 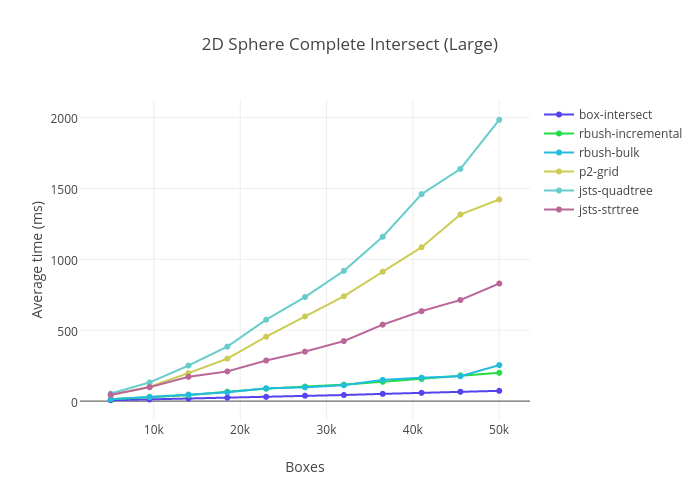 While this can be expensive, for systems with a bounded domain and a dense distribution of objects, the fast access times may make it preferable for small systems or parallel (GPU) simulations. Hash table: For small systems which are more sparse, or which have unbounded domains, a hash table is generally preferred. Accessing the hash table is still , however because it requires more indirection iterating over the cells covering a box may be slower due to degraded data locality. Sorted list: Finally, it is possible to skip storing a grid as such and instead store the grid implicitly. Here, each box generates a cover of cells which are then appended to a list which is then sorted. Collisions correspond to duplicate cells which can be detected with a linear scan over the sorted list. This approach is easy to parallelize and has excellent data locality, making it efficient for systems which do not fit in main memory or need to run in parallel. However, sorting is asymptotically slower than hashing, requiring an extra overhead, which may make it less suitable for problems small enough to fit in RAM. Too coarse: If the grid size is too large, then it won’t be effective at pruning out non-intersecting boxes. As a result, the algorithm will effectively degenerate to brute force, running in . Too fine: An even worse situation is if we pick a grid size that is too small. 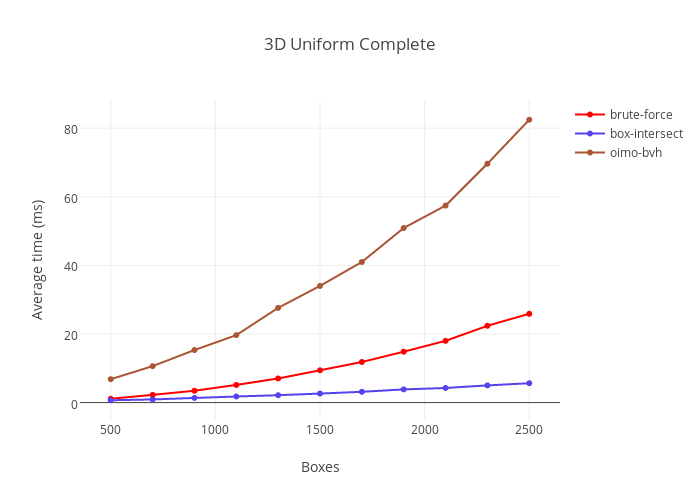 In the limit where the grid is arbitrarily fine, a box can overlap an infinite number of cells, giving the unbounded worst case performance of !!! Just right: The best case scenario for the grid is that the objects are uniformly distributed in both space and size. 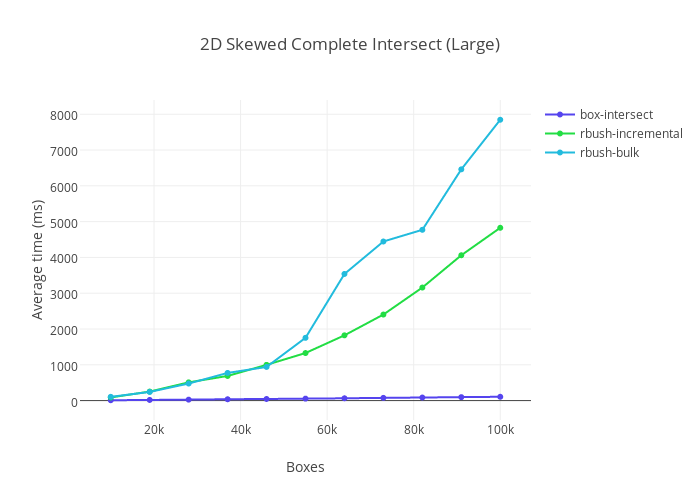 Ideally, we want each box to intersect at most cells and that each cell contains at most objects. In this case, the performance of a grid becomes (using a grid or hash table), or for sorted lists, which for small is effectively an optimal complexity. Size variation: If the side lengths of the boxes have enormous variability, then we can’t pick just one grid size. Hierarchical grids or quad trees are a possible solution here, though it remains difficult to tune parameters like the number of levels. High aspect ratio: If the ratio of the largest to smallest side of the boxes in the grid is too extreme, then grids will always fail catastrophically. There is no easy fix or known strategy to avoid this failure mode other than to not use a grid. While this might sound pessimistic, it is important to remember that when grids work they are effectively optimal. The trouble is that when they fail, it is catastrophic. The bottom line is that you should use them only if you know the distribution of objects will be close to uniform in advance. 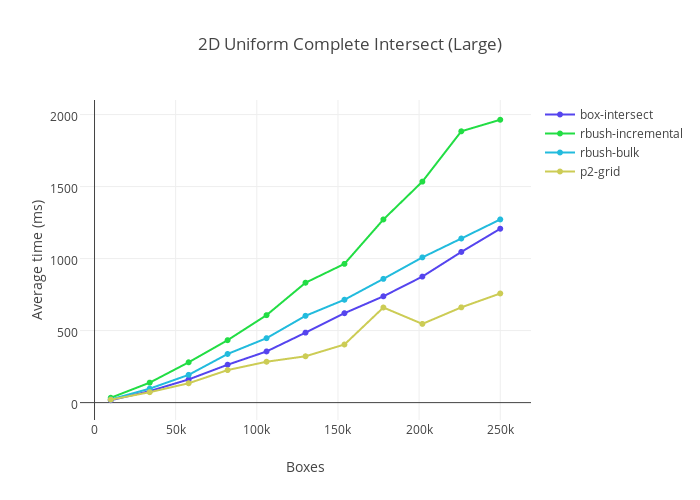 After grids, the second most widely recommended approach to collision detection are partition based tree data structures. Sometimes called “bounding volume hierarchies,” partition based data structures recursively split space into smaller regions using trees. Objects are iteratively tested against these trees, and then inserted into the resulting data structure. Bounding volume hierarchy intersection proceeds by recursively inserting rectangles into the root of the tree and expanding subtrees. The size of a tree with items is at most bits. Each node of the tree is of bounded size and implemented using pointers/references. (As would be common in Java for example). Querying the tree take time, where is the number of items in the tree. Theorem: If a data structure answers box intersection queries in time, then it uses at least bits. 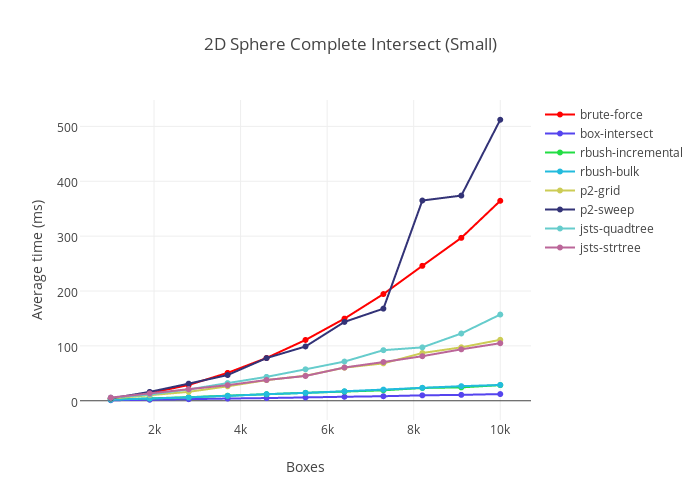 Disappointingly, this means that in the worst case using R-trees as a bounding volume hierarchy gives an overall time complexity that is only slightly better than quadratic. For example in 2D, we get , and for 3D . Still, R-trees are quite successful in practice. This is because for cases with smaller query rectangles the overhead of searching in an R-tree approaches . Situations where the complexity degenerates to tend to be rare, and in practice applications can be designed to avoid them. Moreover, because R-trees have small space overhead and support fast updates, they are relatively cheap to maintain as an index. This has lead to them being used in many GIS applications, where the problem sizes make conserving memory the highest priority. Amongst the ideas in those papers is the reduction of the intersection test to range searching on end points. Specifically, it is true that if two 1D intervals intersect, then at least one of them contains the end points of the other box. The recursive application of this idea allows one to use a range tree to resolve box intersection queries in dimensions using space and time. In this paper, the authors build a segment tree using the streaming technique, and apply it to resolve bipartite box interactions. 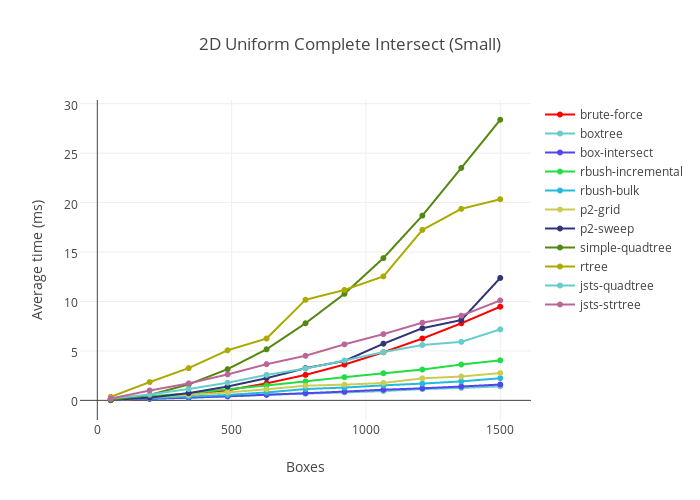 The overall time complexity of the method is , which matches the results for segment trees. In the next part of this series we will look at some actual performance data from real benchmarks for each of these approaches. Stay tuned!